Colic is the term used for inconsolable, excessive crying in an otherwise healthy baby. All babies cry from time to time. But a baby with colic will have bouts of uncontrollable crying, that are more frequent and last longer than in other babies. Colic can be really stressful and upsetting for parents of babies who have it. But it will eventually get better on its own and most babies ‘grow out of it’ by three or four months of age. In the meantime, there are techniques you can try to comfort your baby, and things you can do to look after yourself too. Colic is common in babies – up to around three in 10 babies have it. It affects both boys and girls, and babies who are breastfed and those who are bottle-fed, equally. Colic normally starts when your baby is just a few weeks old. Although it’s not known exactly what causes colic, it’s not thought to be harmful to your baby’s health. However, as a parent or carer, it can be really stressful and distressing. The exact reasons why some babies develop colic aren't fully understood, but there are thought to be a number of factors involved. The main ones are listed below. It may be a result of abnormal contractions and pain signals within your baby’s gut. Your baby may have painful indigestion or wind. It could be that your baby is taking in too much air when feeding, or hasn’t burped properly after a feed. It may be linked to food allergies and intolerances, for example to lactose or to cow’s milk protein. There are other things that seem to increase the risk of your baby developing colic. For instance, smoking during or after your pregnancy doubles the risk of your baby developing colic. If there’s a lot of stress or tension within your family, this can also increase your baby’s risk. Excessive crying can be a sign of your baby being uncomfortable for many reasons, such as being cold, having a wet nappy, being hungry, or being sore from nappy rash. It can also occasionally be a sign of a medical problem, such as an ear or a urinary infection. However, if your baby’s crying is due to colic, they should seem otherwise healthy, feed well and gain weight. If you’re at all worried about your baby’s crying, talk to your health visitor first, or contact your GP. They can make sure there isn’t a more serious health problem. Colic is usually diagnosed after ruling out other possible causes for your baby’s crying. This means your health visitor or GP will want to check your baby for signs of any health problems that could be making them distressed. They’ll ask you questions about your baby’s crying – such as when they tend to cry, how long for and how often. They’ll also want to talk to you about how your baby’s feeding, their sleeping pattern, and whether you’ve noticed any blood in their poo. The health visitor or GP may also want to examine your baby to check for any physical signs of a health problem. Your GP may make a diagnosis of colic if they’ve ruled out any other underlying cause for your baby’s crying. It can be upsetting and stressful if your baby has colic, but there are different things you can try to help soothe them. Different babies are comforted in different ways, and you may need to try a few methods to see what works best. Although there isn’t any scientific evidence that the techniques below help to reduce colic, you may still find them helpful to soothe your baby. Holding your baby through the crying episode. Playing soothing music, singing or talking to your baby. Making sure you give your baby plenty of attention, but without over-stimulating them if possible. Touch or rock them, walk or play with them – be sure to have plenty of eye contact too. Using ‘white noise’ – for example the noise from a vacuum cleaner or washing machine, or from running water. Making gentle motions, such as pushing your baby in their pram or rocking their crib. Giving your baby a warm bath – the warm water may be comforting. It’s important to make sure that your baby isn’t under or over feeding. Try to feed them in a semi-upright position to prevent them from swallowing too much air, and make sure you burp your baby after a feed. If you’re bottle-feeding your baby, your health visitor or GP may suggest changing the size of the hole in the teat, as too small a teat can cause your baby to swallow air. Normally, there’s no need to make any changes to your diet if you’re breastfeeding, or your baby’s formula if they’re formula-feeding. There’s no good evidence that this will help most babies with colic. If your baby’s colic is severe though, or if they also have symptoms of asthma, eczema or hay fever, your health visitor or GP may suggest trying the following. If you’re breastfeeding your baby, cutting out caffeinated drinks, cow’s milk, dairy foods, eggs and nuts. 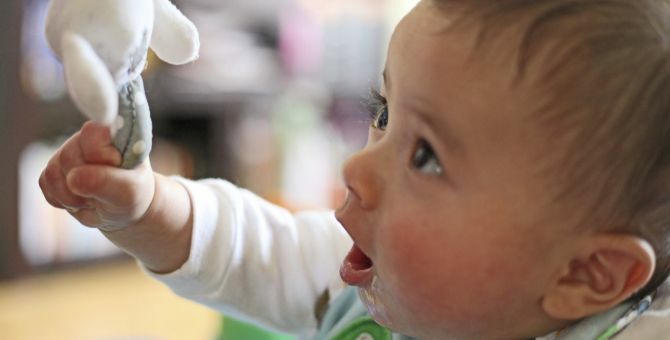 If you’re formula-feeding, changing to a different formula, called a hypoallergenic formula. You should only make these changes if advised by your health visitor or GP. See the FAQ: I’m breastfeeding – could my diet be causing my baby’s colic? – for more information. Lactase drops (eg Coleif). Lactase is a protein that occurs naturally in your body. It breaks down a sugar called lactose, which is found in milk. It’s marketed as making milk easier to digest for your baby. Simeticone drops (eg Infacol). Simeticone is thought to work by helping your baby get rid of trapped wind and reducing bloating. Excess gas has been proposed as a reason some babies may suffer with colic. Dicycloverine (dicyclomine) is a medicine that was used to treat colic in the past, but it’s now known to have serious side-effects. You shouldn’t give this medicine to your baby. Various other therapies have been suggested as possible treatments for colic. These include spinal manipulation and cranial osteopathy – techniques that involve applying very gentle pressure to bones in your baby’s spine or skull. Other things that have been looked into include giving your baby herbal or probiotic supplements. However, there hasn’t been enough good-quality evidence to say how effective these treatments are, and so it’s not currently recommended that you try them. Caring for a baby with colic can be very upsetting, frustrating and challenging for any parent or carer. It can be physically and mentally exhausting coping with the constant crying. It’s important to look after yourself, get support and to take a break if things get on top of you. If you're feeling unable to cope while your baby is crying, put them down somewhere safe, like their cot, for a few minutes so you can take some time to calm down. You may find it helps to ask your partner, a family member or friend to take over for a while. It may be for just an hour or two so that you can have a proper break from your baby's crying. Try to take some time to rest when your baby is asleep. It's good to get out and meet other parents with babies of a similar age too, so ask your health visitor about local baby groups. I'm breastfeeding – could my diet be causing my baby's colic? I'm breastfeeding – could my diet be causing my baby's colic? If you're breastfeeding, there’s a small chance that some of the foods you eat may trigger colic in your baby. There are likely to be other reasons for your baby’s colic though. It’s important not to cut out foods from your diet without getting advice from your GP or health visitor. If you breastfeed your baby, substances from the food you eat can pass to them in your breast milk. It’s thought certain foods that tend to be associated with food allergies could trigger colic in your baby. Normally, you won’t need to make any changes to your diet if you’re breastfeeding and your baby has colic, as there isn’t much good evidence that it makes a difference. There’s also no reason to stop breastfeeding if your baby has colic. But if your baby’s showing signs of a food intolerance or allergies, your GP may refer you to a paediatrician – a doctor specialising in conditions affecting children. Your GP or paediatrician may suggest trying a hypoallergenic diet. This means cutting out cow’s milk and dairy foods such as yogurt and cheese. They may also advise you to try cutting out foods that are known to cause allergies, such as caffeine, chocolate, eggs, wheat and nuts. Your doctor will probably just suggest a short trial at first – normally for between two and six weeks. If after the trial your baby’s symptoms have improved, they may suggest you carry on with this diet while you’re continuing to breastfeed. If you’re cutting out cow’s milk and dairy foods, your doctor will recommend you take a calcium and vitamin D supplement to make sure you’re getting all the nutrients you need. Remember, don’t cut out any foods from your diet without speaking to your GP or health visitor first. How can I tell if my baby is crying because of colic? How can I tell if my baby is crying because of colic? Babies cry for many reasons and sometimes it can be hard to know why. Some of the main causes of crying are listed below – check whether any of these apply to your baby. Wind. Check whether your technique for winding is right. If you’re bottle-feeding your baby, sit them semi-upright when feeding. This cuts down the amount of air your baby takes in during feeds and may help to prevent wind. Burping your baby will also help to get rid of wind. Hunger or thirst. Talk to your health visitor about whether your baby is feeding enough. Temperature. Check whether your baby is too hot or too cold and is wearing appropriate clothing for the weather. Skin irritation. Itchy clothes, labels, eczema and nappy rash may all irritate your baby’s skin. If your baby is crying due to colic, it may sound different to regular crying. It’s likely to be higher pitched, and you may find it sounds more urgent and uncomfortable than your baby’s usual crying. It usually starts in the late afternoon and evening and may carry on for hours. A change in your baby’s crying, particularly if it has come on suddenly, can also be a sign of a more serious health problem. If you’re worried, talk to your GP or health visitor. Reviewed by Pippa Coulter, Freelance Health Editor, Bupa Health Content Team, July 2018.